Whether you own, manage or work in a small contracting business, you’re probably very familiar with the increased pressure that tends to come with the end of each financial year. In fact, you’re probably still catching up with the resulting workload from the tail end of 2018. The last thing any small business needs is extra pressure, and the weight of all that extra admin work seems unavoidable… but that isn’t always true. Although bookkeeping might feel like a chore, there are ways you can make things easier for your future self and your team. Here are our top recommendations for making the accounting side of your business both easier and more profitable over the next year, so you can avoid the headaches when 2020 rolls around. Consider the day-to-day tasks that ultimately help you keep track of your company’s finances at the end of the year. Is there any area that’s been letting you down and complicating things? Perhaps there’s a way you can tighten up the process your team follows, ultimately making sure the right information ends up in the right place at the right time. When it comes to finances in business, most things have to be dealt with urgently and take priority over other areas. This is no different for contractors – bills, suppliers and subcontractors have to be paid, and you have to make sure your clients pay you on time too. Since there are so many time-sensitive things to deal with, this can quickly become overwhelming, but you need a robust system to make sure you stay on top of this and prioritise correctly. If you need to regularly set some time aside just for admin, don’t put it off – eventually you’ll be glad you did it as you went along, instead of leaving yourself with a huge task at the end of the year (when it might be too late to fix any mistakes you missed). Not every business has the same goals. What do you need in the short team to make your business better, from a financial point of view? Is your monthly revenue too unpredictable to make long-term decisions? Maybe one area of your business is costing too much time and money, causing you to neglect other areas? Whatever the issues are, you need to make sure you’re working towards the right goals. Doing more of the same is more likely to dig you into a deeper hole. Take some time to strategise, thinking about where you want to be in 12 months’ time and the steps you need to take to make that possible. This is an area we know a lot about: estimating, the smart way. For any contractor, this is a crucial part of how you make your money. Don’t miss an opportunity to improve it! 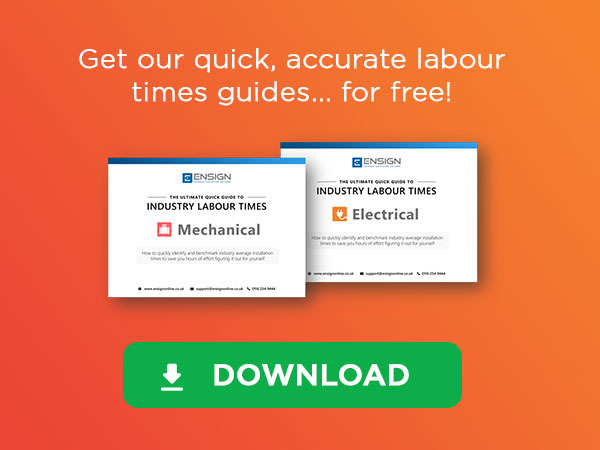 Ensign is an ideal solution for people who just don’t feel they have enough hours in the day to do take-offs, estimates and all the admin that goes with them. It’s quick and simple to use, giving you incredibly accurate results and much more control over how you spend your time. Improving your estimating process will typically lead to drastic positive changes across the rest of your business, particularly the financial side. Simply get more work done in less time, and very quickly you’ll find it much easier to move towards those goals we talked about. Interested in getting a free, personalised demo to find out what Ensign can do for you? Book a no-pressure online appointment here, and we could be talking to you later today.